New year, new wild you. Kids need their wildhood. You need your wildhood. We can feel it: 2017 is the year for all of us to rediscover our wild sides. All it will take is a little imagination, and a lot of time outdoors. Wildhood includes getting a little dirty; escaping your comfort zone; soaking in fresh air like you did when you were young. Here are a few of our ideas to bring back wildhood this year. Here’s something most of us are guilty of: ignoring the adventures in our immediate surroundings. When we think of vacation, we think of faraway places we’ve never been to. The grass is always greener, right’ The problem when we do this is that we literally never explore our own backyards. This year, look for wildhood in your own province. Even look for it in your own backyard. Explore an area that you normally drive by, or plan a camping trip a few miles from your hometown. Find the must-see destinations for out-of-towners, and pretend to be a tourist even if you’re just minutes from home. Find the most cliché sights, sounds, and photo-ops’and enjoy every second of it. Hike in your hometown. Fish by the lake you grew up on. Enjoy your province for everything that it has to offer. We promise, you will find a wild new perspective. On the opposite end of the spectrum, there’s those of us who are creatures of habit. We have a home in the city, and take refuge in our favourite campground just under two hours away. This campground is familiar, friendly, and you know exactly how long it will take you to get from door to door on a Friday at rush hour. Bring back wildhood in 2017 by venturing out of your comfort zone, even if it’s just in baby steps. Find a new campground that’s a little farther away. Skip rocks on a new pond; run down a new path. Bust out the old tent in a new place so the kids can have a sleepover on the cool ground. Do something to remember why you fell in love with camping in the first place. Your travel trailer is probably so decked out with fun toys and accessories that it doesn’t even feel like camping anymore. 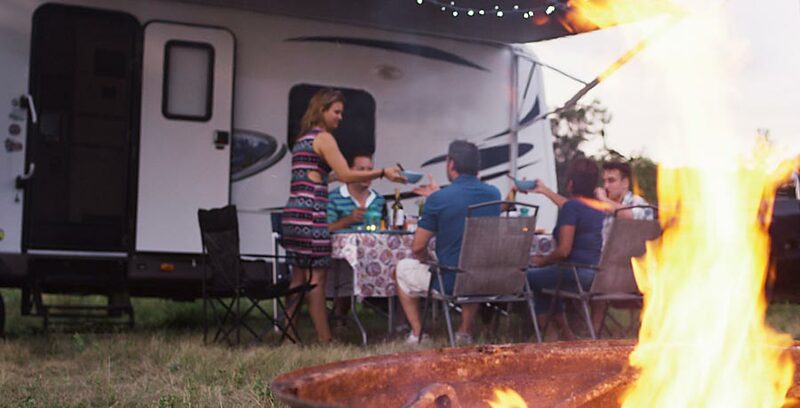 Get away from glamping a little more this year by focusing on one of the most fun parts of camping: cooking over the campfire. Recruit the kids to gather some kindling. Let them eat off of sticks! Show them how to sharpen the end like your parents showed you when you were young. Once you’ve mastered the basics, explore your inner chef: design bigger and better meals’all cooked over the campfire. There’s plenty of fun campfire cookware on the market these days. Pie-irons are a safe bet. Experiment with what goes between the bread, and you’ve got yourself a full meal. Cooking over an open flame makes everything taste so much better. This is an activity the kids will love. Let them help you bring back wildhood by organizing a craft time in nature. Ask them to build something with the materials that nature provides. Kids have insanely imaginative minds. Give them the tools and watch what they dream up. One of our favourites is building a fort in the wild (just check the rules of the campground before getting started). Have them find worthy supports on the ground, plus add a little string and a tarp to make the roof. Create stories to match the fortress they’ve built and let them dive into the wild for an afternoon. For those looking for a more relaxing craft, try making flower crowns or wreaths to decorate your campsite. Collect long grasses, flowers, and thin branches. Look up instructions to weave them together, or go it alone to see what you can create. When you’re finished, wear your newfound wildhood proudly for all to see. Bring back wildhood with a new activity. Rent a canoe for the day, go on a new hike, or bike down a different trail. Are you a bit of an extremist’ Try hang gliding or white water rafting. More relaxing options include practicing photography or writing a travel journal. Go bird watching, or research the plants around your campground. Learn how to fish, then learn how to cook that fish for dinner. Rent a canoe and watch for animals along the water’s edge. Combine all of the above! The options are literally endless. The only stipulation: try something different. Kids love to stay up past their bedtimes. Make a late night seem extra special with an adventure into the stars. Lay blankets out on your campsite, and show your kids how to spot the major constellations. Tell them the stories that align with each sparkling figure. If you’re feeling extra wild, find a star map and use that to dig a little deeper into the glowing expanse. It’s educational, outside of the norm, and totally wild for them. As adults, most of us like to be in control. Bring back wildhood by letting go a little bit. Get a little lost. Next time you’re hiking, take a new path to the same destination. Spin yourself around and walk in a new direction. Force yourself to read the trail map, rather than following the same route you have memorized over the years. See what there is to see on a trail that is new to you. Part two of getting a little lost is teaching the kids how to find their way home. Bring the trail map and a compass, and teach them how to use both. There are so many ways to bring back wildhood if we just look outside of our routines. What are your ideas’ Let us know how you plan to rediscover your wild side in 2017!